Check out this work from artist Robin Barcus: "Collecting Kisses". She put up three dress outlines in a gallery and had people leave lipstick kisses on them. Participatory art, yay! Robin's also doing a series of location-specific dresses for every state in the US, *and* making a movie about it, which is about as cool as you can get without resorting to the illegal use of Freon. She also did a leaf dress that's worth seeing — click on either of the images above to visit her blog. I had a whole list of art-dress projects to post about before my hard drive decided to become an ossified, non-spinny lump … a list I don't really want to recreate by hand, because I'm lazy. So if you emailed me an art-dress link sometime in the last month, and feel strongly about it, would you email me again? Or at least leave a link in the comments? Looks like the condom dress is an attention-getter that just doesn't quit. Since the there's been an entire condom-clothing fashion show in China, to commemorate World Population Day (and to publicize the 4th China Reproductive Health New Technologies & Products Expo, held in Beijing back in July). What I want to know is, why don't I ever see any MEN'S clothing made out of condoms? Aren't they the ones who are supposed to be doing the covering up? Where are the three.jpgece condom business suits? I guess it's just another instance of that old, tired story of birth control being seen as entirely the woman's responsibility. If you click through on the picture you'll see the original post featuring the story, with all the stuff-made-from-condoms you could ever wish to see. But be careful, some of the pictures there look as if they might at any time become Not Safe For Work. And oh, lord, I can't wait to see what kind of ads Adsense serves up to this post! Oh, Fabric, Why Can't I Quit You? I also bought (no pictures … yet) a soft, heavy loden green fabric that is possibly a cotton/wool blend, some lightweight teal denim, and a really nice Liz Claiborne browny-gray ombre-ish stripe. Very somber; I'm thinking I'll try another version of the dress with that last fabric. You know, Real Soon Now. I have come to a sort of détente with my fabric stash: I have an enormous amount of fabric, and yet never seem to have anything I can actually sew with. The fabric I want to sew with has to hit that sweet spot: it has to be something I want to wear, yet not so incredibly gorgeous that I am too cowed to cut into it. (Have you ever tried shopping for "good enough" fabric? It's very difficult. *) So my arrangement is this: I simply buy gorgeous fabric and then wait for OTHER gorgeous fabric to arrive and push slightly-less gorgeous fabrics down the ladder of gorgeousness until they are at a low enough rung to be cut into. Some fabrics, it is sad to say, fall rather rapidly; others have maintained an immunity to scissors and pins for years. The worst is when fabric goes from too-gorgeous to too-NOT-gorgeous and misses the scissor-able stage altogether. *This may be a business model: a site that only sells mediocre-plus fabrics. "Perfect for semi-wearable muslins!" would be its tagline. Or maybe "Fabrics you'll be 'in like' with!" This dress (from the eBay store ) has got a center front zipper closing, which is a feature I always enjoy on purchased vintage dresses, but not something I've ever sewn myself. I love looking at the design trajectory of center zippers: it seems to me (and I haven't done any real research on this, so be sure to read the comments where it is entirely likely I will be contradicted by someone who has Real Knowledge of this subject) that early on in the days of 'zip fasteners' they were exotic, interesting, expensive … and thus they were featured prominently in designs — front and center as it were. (I have a late 1930s-early 1940s black crepe dress which would have been very expensive, new, that has a center front zipper.) As zippers became more widespread and ordinary, even quotidian, they moved from the front to the side and then the back — out of sight, out of mind — and visible zippers, front-closure zippers, became a sportif or even déclassé thing. Front zippers were for play clothes, coveralls, and housedresses, like this one. Anyway, this dress, with its center front zipper, is $9.95 Buy-It-Now and a bust 38. It's advertised as a housedress that's pretty enough to wear out of the house (to the grocery store or whatnot). If I were going to make it, I'd make it in a with a bright red, large-toothed, plastic zipper up the front. Fun! I've had this site, OurThreads.com, open in my browser for a week, trying to decide whether to blog about it. there were only 19 dresses listed when I last checked. Anyway, I'm not sold yet. I think what would really make this site work is a something like Amazon's "Resell Your Books" feature. Sign up a few big online clothing retailers (GAP.com, Amazon, Bluefly, Overstock.com, Zappos, etc. ), and get them to let OurThreads.com users upload their purchase histories. Match people who have similar sizes/purchase histories, and then alert them to each other and see if they want to trade. They could also let you (with a widget/bookmarklet) "shop" on other, non-partner sites and mark things you've bought, which would add that thing automatically to your "closet". For every person who says "eeeew … used clothes?" there will be two who will buy that extra sweater if they know they can sell or swap it in a few months for something new-to-them. Having people upload their own stuff is so old-web, and too much work. Make it passive, or nearly passive, and you're more than halfway there. A really useful site would know/figure out (with my permission) what I've already bought, and then would ping me when people who have similar tastes mark the stuff THEY already bought with a "willing to trade/sell" marker. 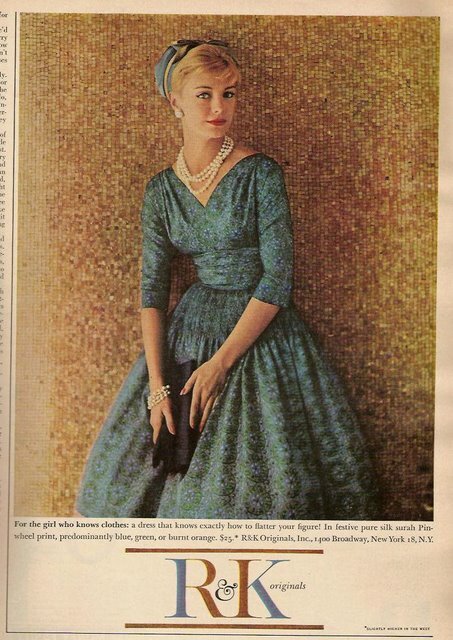 I find looking at vintage dress ads almost exquisitely painful; the whole idea of advertising is to get you to covet the product, but the product, here, is almost fifty years gone. The chances of me ever finding this dress, in my size, in wearable condition … well, they're vanishingly small. Which means I will just have to redouble my efforts on the time-machine-development front, right? And just enjoy looking at the picture. Click to find a free pattern from the V&A for (I think) the dress above. It's in UK sizes 10,12, & 14 (I have no idea what those sizes are in Red-Blooded American, but I'm assuming that's something that's Google-able), and it prints on A4 paper (of which I used to have a stash but don't any longer). So all in all I'm not certain how easy this will be for those outside the Empire to manage, but hey, free pattern for cute dress! Many thanks to Nora and Catherine, who sent me links to this, and to the associated V&A exhibit, . Which, delightfully, will still be around when I'm in London in October. Hurrah! I'm thinking it might just be time for me to become a . Have to encourage this sort of thing!